and BIG flavors. The brew pours a deep, deep, dark brown with ruby highlights. A thin beige head provides a wall of lace. Aromas of dark chocolate and plum mingle with hints of coffee and black licorice. Rich malt flavors dominate the pallet with notes of chocolate, toffee, and dark fruits. Baltic Porter features a long lasting finish and is medium-light in both body and carbonation. We are really digging the Big Eddy series! 2012 vintage, so rating set to current average. Aroma is rich and fruity, reminiscent of treacle and fruitcake. Notes of dark cherry, fig, raisins, and dates accent deeply caramelized malt. Roast is comparatively subtle. Flavor is very toffee forward, more reminiscent of the malt bill found in a wee heavy. Dark fruit dominates, with the roast malt leaving a perception of smoke. Big prune, raisin, tart cherry, and fig notes. Much better than the rating reflects. "A rich, malty brew with coffee, port, and chocolate notes and a dark fruit finish." Brewed in the style of a Baltic Porter. Available in 12 oz. bottled 4 packs and on limited draft as part of the Big Eddy series. Poured from a 12 oz. bottle to a snifter glass. Served above 61 degrees Fahrenheit. This beer pours a medium bodied dark cola brown that gets darker as it pool, minimal head and light carbonation. The nose is malty and sweet with little to no roast. It sure doesn't smell like a Baltic. The flavors too, light for a Baltic with too much of a cola flavoring and no roast. It has some scotch ale attributes to it, also odd. It is also too light in body for the style. Overall this is a pretty bad representation of the style. It really is more like a Wee Heavy than a Baltic Porter. It just needs to be bigger and have more to it. 2013 Artisans craft Beer Festival. A: Poured a deep brown color with a decent head that fades fairly quickly. S: Aroma of roasted malt, chocolate, dark fruit and nutty. T: Taste is similar with roasted malt, some caramel sweetness, chocolate, dark fruit and nutty. Nice bitterness and a dry finish. F: Fairly full body smooth with a creamy texture. the 8.5% ABV is well hidden. O: Enjoyable beer, nice take on the style. aroma is port wine and black licorice that carries over into taste, along with sweet malt and a hint of booze. almost too sweet. never had it fresh, so don't know if aging had a positive or negative effect. one is enough. interesting, but not for me. 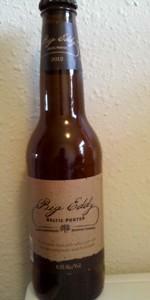 I picked up a bottle of Leinenkugel's Big Eddy Baltic Porter a couple weeks ago for $2.79 at The Lager Mill. I have tried the Big Eddy Wee heavy and Imperial Stout and thought they were both ok, but nothing special and i'm interested to see how this one turns out, so lets see how it goes. The bottling date was smudged by I could still make out that it was a 2013 Vintage, so it's fairly fresh. Poured from a brown 12oz bottle into a snifter. A- I like the label it has a nice homemade and rustic feel to it that makes the label look pretty simple and nice. It poured a deep dark brown color that took on a real dark ruby hue when held to the light with a half a fingers worth of tan head that quickly died down to a thin ring that eventually faded away and didn't really leave any lacing behind. This beer looked pretty average, I wish the color was darker and that there was a little more head, it's not that appealing to the eye. S- The aroma starts off with a higher amount of sweetness that had a slight brown sugar aroma to it followed by lots of malts that impart lots of brown bread, toffee, and caramel like aromas along with a real light roasted aroma and a strong dark fruit aroma with figs seeming to stick out the most making for an aroma that reminds me of a Fig Newton. I don't really pick any hops, instead there's just a medium boozy aroma. The aroma was nice, but I prefer my Baltic Porters to be more balanced and have more of a roasted malt component. T- The taste seems to be fairly similar to the aroma, it start off with a slightly higher medium amount of sweetness that had a slight candied sugar like flavor to it followed by loads of malts that impart some sweet bread, bread crust, toffee, and caramel flavors along with a pretty large amount of dark fruits with no single fruit sticking out more than the others. Towards the end I get a lighter amount of medium alcohol that was slightly warming and it was followed by a fairly light amount of bitterness with just a little more candied sugar sweetness. This beer didn't taste bad, but it didn't taste true to style, it had more of a wee heavy flavor than a Baltic Porter flavor with no roasted malts coming through to balance the flavor out, it was barely average. M- Fairly smooth, a little chewy, slightly creamy, a little fizzy, on the lighter side of being full bodied with a higher amount of medium carbonation that was a little prickly. The mouthfeel was a slightly above average, it was going in the right direction, but the carbonation was just too lively for the style. Overall I wasn't impressed with this beer and I thought it was an average at best example of a Baltic Porter, it just seemed much more like a Wee Heavy since it really didn't have any of those nice roasted flavors and aromas that I look for in the style. This beer had decent drinkability, it was fairly smooth and even though the flavors weren't true to style they still held my attention, but I think one would be enough for me, I don't feel the need to crack open another one. What I liked the most about this beer was the aroma, it was actually nice, it just wasn't true to style and it lacked the roasted aromas that I was looking for. What I liked the least about this beer was that it tasted much more like a wee heavy than a Baltic Porter, where did all the roasted malts go? I wouldn't buy this beer again, I would much rather have a Thirsty Trout Porter from Dark Horse, it's a little cheaper and it's much truer to style and tastier, I wouldn't recommend this as a good Baltic Porter. All in all i was let down with this beer, it didn't taste bad, but it wasn't what I expect from the style and it was really missing the roasted malts as a key component of this beer. So far I haven't been impressed with any of this beers from the Big Eddy series and this one is no different, I'm starting to lose hope with the series, but I hope the DIPA is better than the rest, better luck next time guys. 12 ounce bottle into tulip glass, best before 9/5/2013. Pours crystal clear very dark reddish brown color with a 1-2 finger dense khaki head with good retention, that reduces to a small cap that lingers. Nice soapy lacing clings on the glass. Aromas of caramel, toast, toffee, chocolate, brown bread, molasses, raisin, prune, nuttiness, light roast, and toasted earthiness. Very nice aromas with good balance of dark malt notes with moderate fruitiness; and good strength. Taste of caramel, molasses, toast, toffee, chocolate, brown bread, raisin, prune, light roast, nuttiness, and toasted earthiness. No bitterness on the finish; with lingering notes of caramel, molasses, toast, toffee, chocolate, brown bread, dark fruit, nuttiness, light roast, and toasted earthiness on the finish for a good bit. Very nice balance and complexity of dark/toasted malt flavors with moderate fruitiness; and zero cloying sweetness after the finish. Light-medium carbonation and medium-full bodied; with a creamy and slick mouthfeel that is nice. Alcohol is well hidden with only a small warming noticed after the finish. Overall this is a very nice Baltic porter. All around nice balance and complexity of dark/toasted malt flavors with moderate fruitiness; and very smooth to sip on. A very enjoyable offering. Pours cloudy dark brown with quickly fading razor thin head. Aroma is of rich roasted caramel malt with some mild dark fruity notes. Taste is sweet dark mild roasted caramel malt, coffee bean, some dark fruity notes, dried figs and mild bitterness. Palate is medium body, slightly viscous mouth feel, moderate carbonation. Finishes with mild dark roasted caramel malt, mild dark fruity notes and a mild roasted malt and coffee bean, mild dark fruit on the backend. Overall, this quite a good and tasty Baltic Porter. I like. Appearance – The beer pours a deep-deep chestnut color bordering on black. Upon pouring there is a thin tan colored foam sitting atop the brew which fades rather rapidly to leave almost no lacing on the sides of the glass. Smell – The aroma is a nice mix of a dark roasted malt aroma and some rather strong boozy aromas of port. Along with these smells are aromas of chocolate, caramel, as well as some dark fruits bringing sweeter notes to the nose and combining with the others to give a nice warming aroma to the brew. Taste – The taste starts out with some roasted malt flavors as well as quite a bit of a sweeter dark fruit flavor of cherry and raisin. As the flavors advance more sweetness of some plum as well as a red wine like boozy grape flavor come to the tongue. A bit of a cocoa flavor comes more toward the end of the taste, along with an increase in the alcohol flavors due to an oncoming port taste entering the taste. In the end, the combination of sweeter dark fruits and boozy flavors leaves a rather port wine mixed with roasted malt flavor to be left to linger on the tongue; warming the mouth nicely. level, on the other hand, is slightly above average. For the style, the opposite characteristics; a lower carbonation and thicker creaminess, may have better suited the style giving all the boozy fruit flavors a chance to soak into the tongue. Overall –Not a bad Baltic overall. There are lots of port and dark fruit flavors swirling within this one, creating a rather fruity and sweet brew.